This account of the rise of punk in East Germany is openly the work of a devoted fan of that scene. Tim Mohr is upfront about his emotional investment in the topic. The book he has created is fervent and personal. Its language is impassioned, to the extent that the narrative is broken by inserted slogans and chants, and apparently calm accounts suddenly explode in exclamation points and ecstatic profanity. This approach isn’t altogether inappropriate, given the subject matter and the mood of both the time and punk as a cultural ethos. 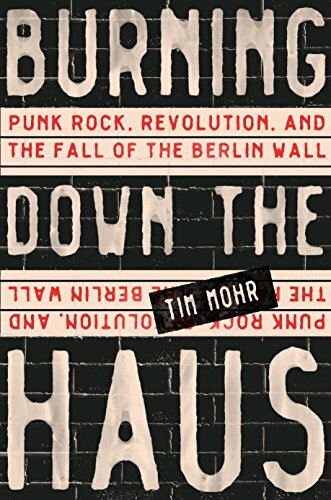 Mohr’s version of punk is deeply personal and stands in opposition to nearly all kinds of authority, including the authority of the disinterested historian. The early part of the book chronicle punk’s in East Germany via western radio broadcasts, and individual teenagers’ adoption of punk identities. These chapters are intimate accounts of teenagers beginning to recognize that their lives and freedoms are brutally restricted. “Punk” in its western, nihilist sense is an alien thing, but the music and style offer the possibility of rebellion: aggressive obscenity in response to an obscene and aggressive state. For these teens, clothes came first, tied to secretive home taping. Bands arose later, less out of musical interest than a desire to perform resistance. Punk represented the potential for difference and dissidence, and the secret police’s response to these early rebellions reinforced the legitimacy of a form of teenage rebellion that in western countries has often been dismissed as juvenile and absurd. Mohr’s account of punk activism is heroic. In his version of East German history, the punks are the boldest, most determined, most provocative of all resistance groups. His direct portrayals of punk resilience in the face of state violence are certainly moving. They demonstrate the fundamental courage involved in dissidence. Yet he also acknowledges that those who were expatriated from East Germany after prison, or who otherwise gave up the punk scene, did so out of trauma and in search of self-preservation. Otherwise, though, emigrants (those who sought freedom by leaving East Germany for western countries) are generally condemned as selfish, apolitical, and insufficiently committed to creating change. The question of who created change is a crucial one in Burning Down the Haus, and in this Mohr is not entirely convincing. The later chapters of his book move away from individual stories toward institutional ones, focused on groups and movements. Punks and the associated church-based Open Work movement form the center of his account of the revolution. Other activists, focused on peace, environmentalism, and human rights, are treated as secondary and often ineffectual, but Mohr offers little evidence for this beyond the punks’ obvious revolutionary spirit. The collapse of East Germany remains one of the great progressivist triumphs of the 20th century. Mohr offers a reasonable account of the collapse, but his book is at its best in its early, intimate moments, showing beginnings rather than endings, individuals rather than movements. His overall account doesn’t quite find its audience, though. Punk engagement fights with historical knowledge for the book’s central focus. The two aren’t incompatible, but they’re unfriendly bedfellows. The punks are friends, but the history slides dully by, moving across time without the friends who made it engaging.